This entry was posted in Local business and tagged Super Stop & Shop. Bookmark the permalink. Yes, I went to S&S last night (in some desperation!) and decided out of respect to the workers that I should go elsewhere. I realized I was going to be in New Canaan later so I decided to get what I absolutely needed at Acme — and hope for a quick resolution! I know we live a life of relative privilege and feel that the right thing to do is support those who are protesting civilly and respectfully asking us to shop elsewhere. Please, please respect picket lines. Organized labor has taken a bad rap lately, but the only power underpaid workers have is collective bargaining, and our inconveniences donot stack up. Many of the workers at S&S certainly can’t afford to live in Westport — many can’t even afford a car – they must take the bus to get to this job to try and feed and house their families. I have never crossed a picket line in my life and I don’t intend to start now. Realize it took union members getting beaten and even killed on picket lines to bring us the 8 hour work day and “the weekend”. For years now I have refused to bag my own groceries at Stop and Shop to save baggers jobs. Each time, after I tell the cashier of my refusal, I next tell them that I, likewise, refuse to use the automated cashier in order to save her job. They usually smile, thank me and bag my groceries. On a really good day they call one of the few remaining baggers to their station to do it. I have often dreamed about what would happen if other Westporters took the same principle stand in solidarity with the baggers and cashiers. There would be more jobs, job security and dignity for these workers. So I ask all of you: when the strike is over and we return to Stop and Shop will you please consider joining me in supporting the baggers and cashiers by not not bagging your own groceries or using those ever expanding automatic cashiers? Being a long time Westport resident. It is so sad to see this. These people make no money working at that store and I would never shop there during a strike. So many other good stores to choose from locally in Westport. I think Stop and Shop has not been good for a long time and I will support the other stores in the area. We have several viable options to choose from, within our town borders, including Balduccis, Fresh Market, Trader Joes, as well as several smaller specialty markets. No one should go without, consumers without their goods, and these workers without respect and dignity. It’s not hard to treat people correctly, and if it means paying someone an extra $2000 per year, that will make a much bigger difference in their lives, than what amounts to small change to the institutions and ultra wealthy that the money would go to instead. Plan B is Fresh Market. But can’t get some cleaning supplies there. Walgreens & CVS have plenty of cleaning supplies. I agree with Amy, Jeff & Janette – my family will not cross their picket line! These people are striking to ensure livable wages for themselves, for reasonable contributions to their health care plans and for fair pay for working on Sundays. It’s encouraging to see so many Westporters respecting the picket line and supporting these hardworking people. Moreover, if employees are not working to monitor food refrigeration, replenish fresh produce, dairy and meat inventory, guessing the items may not be safe to eat – plus the non perishables are not getting stocked so they might be out if whatever it is you’re looking for. How much does Stop and Shop pay their workers compared to Trader Joes, Balduccis and Fresh Market? Perhaps if these grocers posted information about their wage scales and benefits we could make more informed decisions about where to shop. Doubly poignant for us: the headquarters of UFCW Local 371 is located on Post Road West in Westport! Per their website, they are striking 253 stores in New England. I agree: support the picket line. It may be inconvenient for us, but it is a livelihood for the workers. Will absolutely respect the picket line. Thanks to all who have responded likewise in the comments. I will not cross the picket line out of respect for the employees. plenty of other stores in town! I’ve been using the self-checkout for years, as I find them quicker and easier than standing in line for a checkout clerk. I realize my mistake now, as Stop & Shop has been hiring fewer checkout people or letting some go, as noted in one of the strikers’ complaints. I’ll take a little longer in the future, and hopefully save someone’s job. Yesterday, in the comments in Dan’s original post about the strike, I mentioned my grandmother and why I won’t cross the picket line out of respect for her. I should explain — my beloved “Grandma” was a labor union organizer, who got involved after the Triangle Shirtwaist fire that killed 146 young women. I went to fresh market instead. I heard the produce is yucky at stop and shop and the store is a mess. Hope this issue gets resolved quickly. And of course, support the workers and don’t cross the picket line. I will not cross the picket line. This morning I was in Wilton and shopped at the Village Market…wonderful fish department and great produce…and every thing else one might need from a grocery store….plus very nice people that work there. Do the republicans want the minimum wage held to $8 per hour? Can some of you enlighten the republican platform on wage? Always make it political. Your state that I called home for 45 years has been run mostly by democrats. So go figure that out. Wake up Richard. Stop drinking the Democratic kool aid it’s not working. it is a legal question. Are free and open markets allowing for a living wage?? I will not cross the picket line. I shopped at Fresh Market this morning and I’m heading over to Stiles shortly for fish. We are lucky to have so many choices in town, but I still hope this is resolved quickly! I will not cross the picket line. 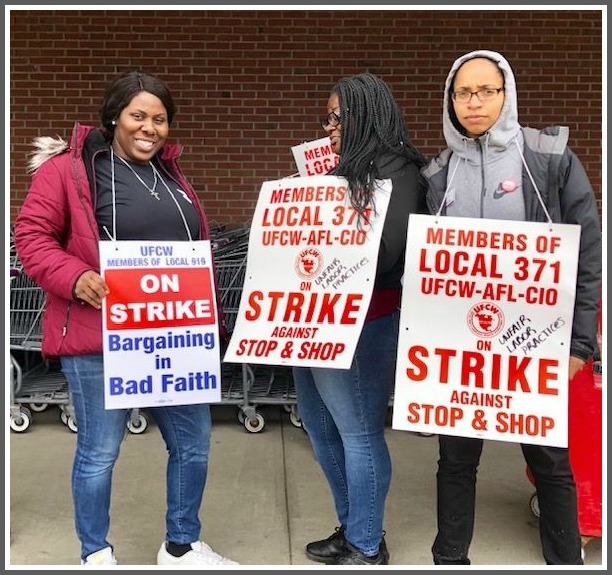 To those who went to Fresh Market….they are non unionized. Respecting the picket lines is a no-brainer for me. People working for slave wages while the investment class rides high is truly making America a sad place. My father was a labor organizer for Communications Workers of America. I could never cross a picket line. Though not all the demands of all unions are justified or socially beneficial all the time, no one should cross a picket line unless a necessity. Crossing one screams out “I don’t give a damn about you or or you plight.” It’s simply rude,I think. I noticed Home Depot has put in a lot of automation over the past few years, as have many other large store chains such as BJ’s. If this is purely about wages, how do the wages of Stop and Shop compare to all other grocery stores? Do we know, or just assume because people are picketing they must be worse? What is the side of Stop and Shop on this? What if someone from management were to picket the picketers, would we cross that picket line to shop out of respect, because they are picketing for us to do so? Stop and shop has been going downhill for a while- few employees in the store, no one to bag groceries, etc. I hope that this shows the company that there’s a link between employee happiness and store quality. Keep in mind that Shop Rite (Fairfield, Norwalk, Milford), Big Y (Trumbull, Monroe, Shelton) and Caraluzzis (Georgetown, Newtown, Bethel) have more employees with nicer uniforms, cleaner, nicer stores, and there’s always someone to bag your groceries! So it appears this is only about the stores in 3 New England States, and Stop and Shop’s take is that it needs to remain competitive in these states as they are one of the few union grocers left in New England. Just to be clear, the 2 billion dollar profit mentioned is for the parent company as a whole, not just Stop and Shop Stores…and I’m sure the competition in terms of rent, taxes etc. is different at each store location in each different state etc. Not taking sides, just being informed. In real life, if you can’t compete in certain areas, you shut down. Westporter’s should be familiar with this…. empty stores and less jobs. Let’s hope it works out for all involved. I will always shop at Stop and Shop. In 2019 they are experiencing what I in the private Corp sector learned. Getting permanent part time hours in a bad economy with rising healthcare costs hit us then. I’m not a big union supporter. I keep my skills up and get a job. It’s my job to perform in order to keep my job. Being “accountable” is everyone’s responsibility in this country. I started doing some reading. I do not have an opinion one way or the other but found some interesting facts. Stop and shop has some of the best priced health care with the lowest deductibles compared to most other places and they also offer pension. It seems two main points of contention are a $24/month ask of employees to contribute towards health care plans that have a $2-300 deductible (extremely low deductible and very tiny increase in cost – pretty much unheard of this day in age as most companies have gone to $3000 deductibles and some times $hundreds per month in employee contribution towards cost). Also it looks like Stop & Shop wanted to either reduce pension benefits for new employees or have them contribute towards their pension. Pensions at most companies have been done away with for many years now and those that remain have started to ask employees to contribute in order to receive a match or higher benefit. It also looks like talks were on-going and usually strikes happen when talks have completely stalled. I am gathering this all from multiple sources but unless I am missing something it doesnt seemed far-fetched what Stop and Shop is trying to do. I went to the ShopRite on Black Rock Turnpike this afternoon. It was absolutely mobbed! It was so packed, you could barely manage to squeeze your shopping cart through the crowds. There was someone directing traffic — e.g,, “please go to checkout 10; please go to checkout 7,” etc. There was also a problem trying to find a parking space. In addition to the regular ShopRite patrons, there were also Stop & Shop refugees from the one in Westport and two in Fairfield. I sure hope the strike is over soon — to the satisfaction of the strikers.